Every time someone new comes to town, they’re usually very surprised that our mountains are actually in the city, adn that it doesn’t take a long drive to get there. 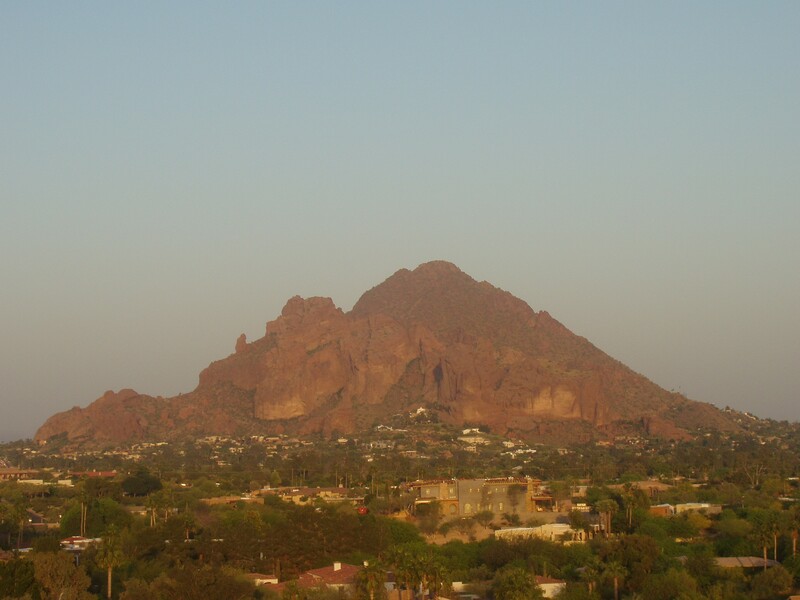 One of the most frequented mountains is Camelback Mountain, the backdrop for so many resorts and multi-million dollar homes. 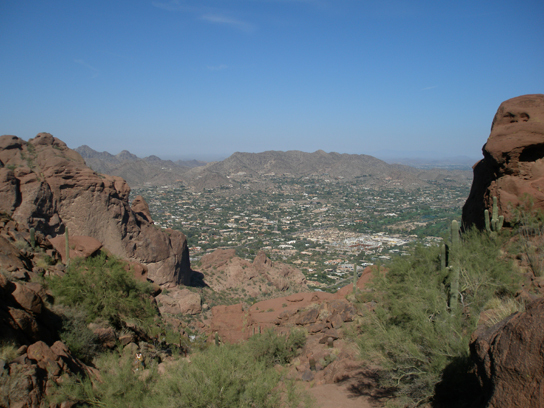 You can hike Camelback from opposite areas on two different trails: Echo Canyon and Cholla trails. Now, there are a couple paths at the base of CM if you just want a little stroll, but Echo and Cholla trails are the real deal. Jeans, loafers, khakis should all stay at home. This is the time to break out hiking shoes or good athletic shoes, a hat, sunglasses, athletic gear, etc. It’s a good idea to wear extra sunblock and extra deodorant too. Both trails are extremely rewarding with viewpoints throughout and the extraordinary perspective from the top. Echo Canyon is more out-right difficult, with boulders acting as a natural StairMaster, poles to let your arms help out on steep parts, and some narrow passes. Going up and back on Echo could take about 3-4 hours; less if you’re in great shape. You’ll see people running up and down in a half hour, but don’t be intimidated. Cholla trail is a more traditional path, but that doesn’t mean it’s easy. The final quarter is steep narrow passes through huge slabs of boulders, making you work for the visual reward at the pinnacle. Cholla takes about 1.5-3 hours, depending on your condition. If you have two cars, I’d recommend hiking up Echo Canyon and down Cholla, as Cholla is easier on the descent because there aren’t as many boulders to step down. Or, try both of them on different days. If you can’t get to the top the first time, the reward of both the viewpoints and the experience is just as great. One thing – make sure to bring a lot of water. It’s not uncommon for first-timers to run out and have to use the water of other people on the trail, which nobody likes to do. Make sure to bring a couple bottles or something to wear on your back with a water bladder. The link below has a map and more description for the trails. Happy hiking! 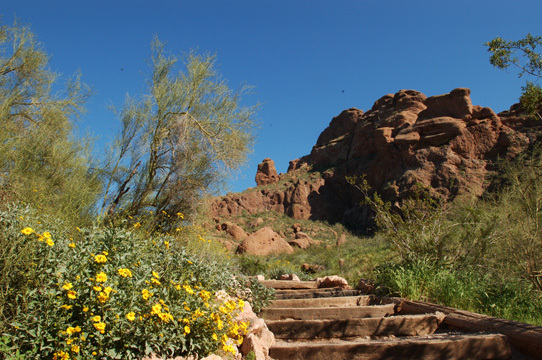 This entry was posted in central phoenix, hiking, things to do, VisitPhoenix. Bookmark the permalink.